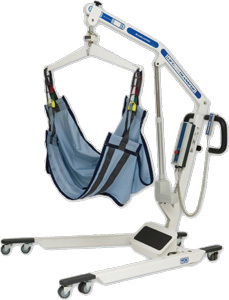 The POWERLIFT 1000MOB BARIATRIC LIFT AND TRANSFER- ARM STYLE by Wheelchairs of Kansas is the traditional style, portable lift constructed of heavy-duty steel. 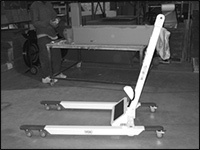 The easy rolling casters allows to position the lift into varies locations with all six that swivel. 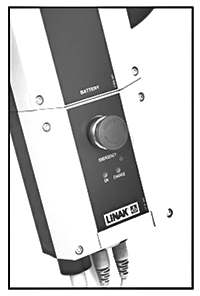 The lift is operated by a four-button hand control and a linear driven actuator that is practically silent. 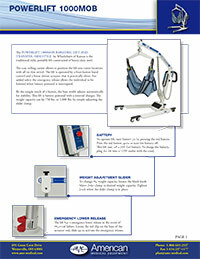 For added safety the emergency release allows the individual to be lowered when battery powered is interrupted. By the simple touch of a button, the base width adjusts automatically for stability. This lift is battery powered with a internal charger. The weight capacity can be 750 lbs. or 1,000 lbs. by simply adjusting the slider clamp. To change the weight capacity, loosen the black knob. 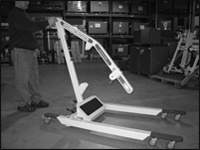 Move slider clamp to desired weight capacity. Tighten knob when the slider clamp is in place. The lift has a emergency lower release in the event of electrical failure. 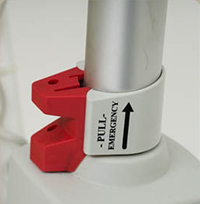 Locate the red clip on the base of the actuator rod, slide up to activate the emergency release. To operate lift, turn battery on by pressing the red button. Press the red button again to turn the battery off. This lift runs off a 24V Gel battery. To charge the battery, plug the lift into a 115V outlet with the cord. 1. Remove all packing wrap from the lift base. Remove the two bolts, washer and nuts from the base. Insert lift mast into position securing with the 2 bolts supplied. Place washer and nut on the end of the bolt and tighten using a 3/4” wrench. 2. Remove the bolt at the top of the lift mast. Place the lift arm in place. Be sure when placing the bolt through to place the smaller washer on the outside of the mast, then the larger washers next to the arm. See picture below for proper placement. Secure nut with 9/16” wrench and #3 allen, then tighten acorn nut. 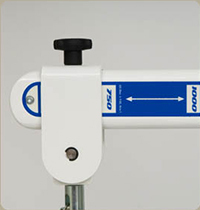 Lift arm should move freely up and down. 3. Attach the bottom of the actuator first using a #3 allen wrench and ½” wrench. 4. Using the #3 allen wrench and ½” wrench, attach the top of the actuator. 5. 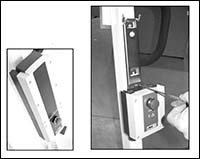 Using a #3 allen wrench attach the smaller or bottom portion of the battery to the lift mast. As shown in the picture. The larger or top portion of the battery snaps into place by placing the bottom into the lower half of the battery. Then snap the top into place. 6. Looking at the bottom of the battery pack, starting at the left, plug in the hand control cord, next plug in the arm actuator cord and then base (black cord) actuator cord. The cord that plugs into the wall is used to charge the battery, plug it in above the other outlets as indicated. 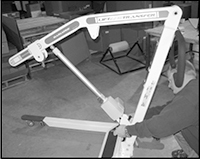 After assembly is complete, articulate the lift to check all functions are performing properly. 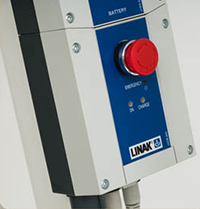 To operate lift, turn battery on by pressing the red button. Press the red button again to turn the battery off. NOTE: The lift will not operate if plugged into 115V power source. 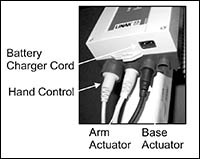 Looking at the bottom of the battery pack, starting at the left, plug in the hand control cord, next plug in the arm actuator cord and then base (black cord) actuator cord. The cord that plugs into the wall is used to charge the battery, plug it in above the others as indicated. 1. Fold sling in half lengthwise. 3. Place folded sling along length of patient as close to back as possible with lower edge of sling slightly below Knees. 4. Roll patient back toward attendant and open sling fully. 5. Roll patient back so they are centered along the length of sling. 7. Using the hand control, lower the spreader bar down to the patient. 8. Attach the straps from the sling onto the spreader bar. Weight of Lift 212 lbs. Shipping Weight 2 boxes - 113 lbs. and 131 lbs.